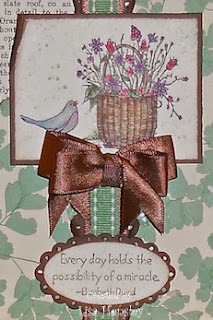 The Shabby Stamper: Yet another Creative Crew card using the Woodland Walk dsp! Yet another Creative Crew card using the Woodland Walk dsp! One of this month's Creative Crew challenges was a color focus using SU! 's Woodland Walk dsp as a guide (Garden Green, Wild Wasabi, Very Vanilla, Crumb Cake and Chocolate Chip). I've never been a fan of either Garden Green OR Wild Wasabi, but I have to admit that I really like this color combination! The earth tones really ground them the brighter greens. I think that the stars of this card are the shabby, distressed scallop trim down the center and the sentiment. I love doing the peeling wallpaper with the First Edition dsp. Lisa, you offer such creative inspiration to all that I wanted to pass on the Stylish Blogger Award to you!! I listed your name and blog link in my post below! Thanks for sharing with us all! !